Biologic therapy includes innovative treatments that enhance the body’s natural capacity to heal. It is a type of regenerative medicine that uses various technologies to harvest the natural healing resources of the body such as stem cells, platelets and growth factors and targets their activity towards areas that need healing. These regenerative substances are present in various tissues and are usually obtained from the bone marrow, blood and fat. Biologic therapy is used to treat various medical and orthopaedic ailments. It enhances the body’s ability to heal injuries including broken bones, and injured muscle, tendon, and ligaments. It can slow down degeneration, reduce pain, improve movement and delay the need for surgery. In order for joints to move smoothly, they must contain an adequate amount of cartilage and synovial fluid, which acts as a lubricant and shock absorber. Osteoarthritis causes the cartilage to wear and synovial fluid to lose its properties causing painful rubbing of the bones in the joints. Viscosupplementation is a procedure where a gel-like substance called hyaluronic acid, which is a component of synovial fluid, is injected into the joints to increase its lubricating and shock absorbing properties. Amniotic fluid (AF) is the protective media which surrounds the amnion, the sac which encloses a developing fetus in the womb. This amniotic membrane (AM) and fluid have been found to be excellent sources of precursor cells that have the ability to multiply and transform into cells of any tissue. Amniotic fluid therapy may be used to treat wounds, soft tissue defects and joint conditions. This fluid may be applied topically or injected into deep tissues. 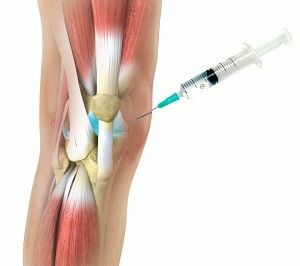 These injections also contain growth factors, proteins and other extracellular components, which facilitate the healing process, reduce inflammation and act as a scaffold for new tissue growth. Please call or click here to request an appointment online.